Portable Antiquity Collecting and Heritage Issues: Is ISIL Sending Artefacts from Palmyra to Urfa? For the last two years or so we have been subjected to a series of "reports" of journalists sent over by their editors to warm countries investigate the ISIL-antiquities trade and each of them coming up with material that looks tediously the same and uses the same information. Yet another in this same genre is a report by NBC's Richard Engel, Aggelos Petropoulos and Ammar Cheikh Omar ('Smuggler of Stolen Artifacts From Palmyra Speaks Out About ISIS' Illicit Operation' NBC Apr 6 2016, see the video here, from 26 seconds in). This is just so cringeworthily dreadful. Just what do these people think they are doing? If there is a trade in such things, why is their fixer unable to produce better material? A man with a long black scarf wrapped tightly around his face sat down in an apartment in southern Turkey and placed a plastic shopping bag on a table. He reached inside to reveal a 20-inch-tall relief. The sculpture, he said, was the last in a series of artifacts he had been selling in the country on behalf of ISIS. 2) Location: Where are they? In "southern Turkey" we are told, except then Engel is shown strolling through the souk at Urfa, with the same shirt and trousers on, the unironed collar of the shirt rolled under in the same way in the souk and the indoor shots. What's the betting this was filmed in Urfa on the same day? The problem with this is since the Tel Abyad offensive last year, the border has been closed here to direct ISIL traffic (Syria: Antiquities Trade through Porous Northern Border Interrupted?). Any antiquities going through the border would be passing through further west (as the Russian ambassador to the UN surmised). 3) The goods (1): Once again, we are shown some telephone shots of the antiquities he has sold, three of them (two figurines and a tablet) are the worst fakes anyone could imagine, they even look a bit like they are resin casts. The stone bust is a little more convincing, but I personally think that it too is fake. The second figurine is a tourist fake of a generic "Egyptian god" with a khepri hieroglyph at his foot. 3) The goods (2): Then we have a "twenty inch" (no it is not) stele of Yarhibol the sun god who was worshipped at Palmyra. It is in a cloth bag which is in a carrier bag with Turkish writing on it. It seems to be the only artefact the 'smuggler' has brought along to the meeting, but it is shown in a different room from the exotic sitting-on-the-floor scene. Is this the same house? I'm not convinced either way if it is a fake or not. NBC News showed pictures of Abu Mustafa's artifact to several leading experts, and while none of them could verify the object's authenticity from a photo, most of them agreed that it most likely comes from Palmyra and dates back to the first or second century A.D. A similar artifact from the Palmyra museum, used as a reference by some of the scholars, is said to have been unearthed in the renowned Valley of Tombs. Syrian archaeologist Amr Al-Azm, now at Shawnee State University in southern Ohio has seen photos and says it probably is real - but then was he shown the four other objects? If he was shown just this one, and has now seen the film, is he still prepared to say it is kosher having seen what else this "trafficker" says he was carrying? Bearing in mind the nonsense-objects we are shown by the masked man, we really need to look at this object more carefully. Is it a genuine antiquity looted by ISIL from Palmyra? I think the photos show an object which is carved (rather than being a plaster cast) and it could be real, but the face seen at 2:47-2:49 is rather doll-like. As mentioned, there was one a bit like it in Palmyra Museum from the valley of the Tombs, the same eleven-ray solar halo, the same curly hair represented by knobs, but the Museum one had a heavier (and untapered) frame and the sculptor had understood the notion of 'sleeves' and a better idea of proportion. In particular the position of the hand on the body and the size of the crown in the NBC one are suspicious. I think it is entirely possible that the Abu Mustafa one is a rough copy of the one in the Museum (which was presumably itself evacuated in May 2015), though would not put money on it either way. I would not have bought it, with or without a kosher provenance and export documents. 4) The goods (3): Not shown in the video but figured in the article are two Palmyran busts.I'll discuss them in a separate post. Abu Mustafa said he personally transferred and sold more than 10 artifacts. He also showed NBC News the travel document that was issued for him on ISIS letterhead, permitting him to travel freely inside Syria and on "to the infidel country — Turkey," the document reads. Trust among smugglers is hard to come by, and Abu Mustafa said that an emir drove him part of the distance to Turkey a few times in order to keep an eye on him and make sure he didn't run off with the precious spoils. The emir also ensured that after the items were sold, Abu Mustafa would be sending back 85 percent of the money to the emir. Abu Mustafa claims that the buyers were German, French and even Americans, and that the artifacts were sold for as much as $60,000 per piece — but there was no way of verifying either of those claims. Al-Azm believes that Abu Mustafa trades in the lower end of the illegal market. There is no way of verifying any of it. I am still left wondering how the percentage to be given of the proceeds of a necessarily clandestine sale conducted in one country is verified back over the border in ISIL-land. Are there invoices? Also one wonders how the artefacts reached Urfa, if an ISIL-emir drove the smuggler personally "part of the way" to the border crossing, one might guess that since they'd not pass through Kurdish held territory, they'd have to go west south of lake Al-Asad, to Manbij and then north to the border at Jarabuluz ... at what stage did the emir get out of the car, and then how did the smuggler travel further? Why then did he double back on his tracks and head east for Urfa rather than move west (to the regions the Russian ambassador infers are currently the main centres of trade)? Then again, there is another problem/discrepancy. We have heard of the excavation permits which ISIL issues with the aim of claiming a khums tax from the diggers from the profits of what they sell. But now we are asked to believe that instead (perhaps in some cases) ISIL leaders get the actual artefacts which they then send abroad via smugglers, so who then pays the khums tax? 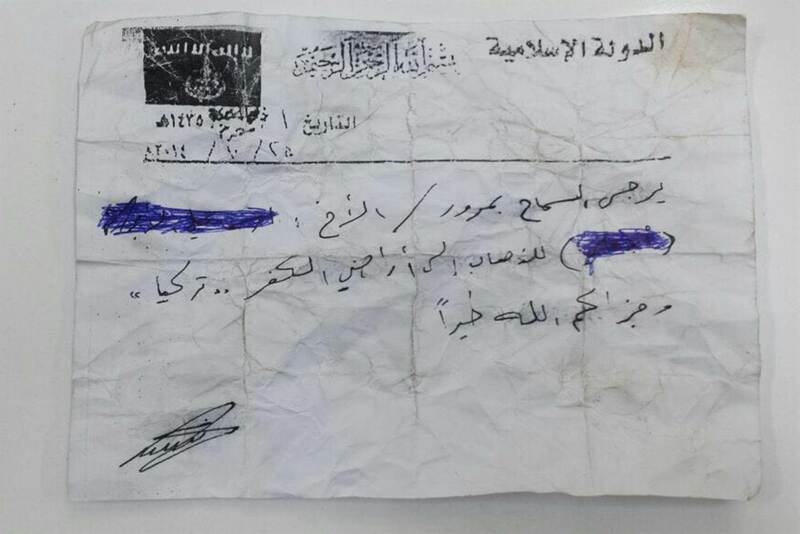 Is the money from any antiquities that are sold going into ISIL war-coffers, or the pockets of a few ISIL leaders? To whom were the tax receipts allegedly found in the Abu Sayyaf raid issued (if they are real)? Is this part of the same kind of system? The story really does not hang together very well. They've retitled the piece: Smuggler Explains How ISIS Turns Ancient Artifacts Into Mass Profit Wed, Apr 06 (" The world has already witnessed the barbarity with which ISIS treats precious monuments, but now, a smuggler is showing how they are selling the artifacts to fund their terror"). When of course this video report does absolutely none of those things... Pathetic.